Based in Englewood, CO, TeleTech is a global BPO that hires 50,000 people in 17 countries. While much of its worldwide workforce is office-based, its Teletech@Home division hires virtual (or work at home) call center agents in the U.S. and U.K. to services its clients. An agent must commit to working at least 20 hours a week, but hours are typically 20-30 per week. Weekend and holiday work is required. Paid online training is provided. There are also positions for home-based quality assurance specialists. These agents monitor the calls of other agents to be sure customers are satisfied and that agents are adhering to client and company procedures. Work-at home-agents are required to provide their computer, Internet and telephone service. There may be other required equipment purchases. 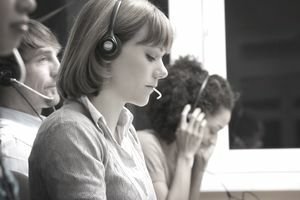 As with most home call center companies, employees are required to supply their hardware. Agents need a PC (not Mac) with a DSL or cable internet connection, and a USB/VOIP headset. (See more of the typical office requirements for home call centers.) However, most of the time a phone line is not required, as customer calls come in through the internet, but a dedicated cell or landline phone is needed for contact with the company. The minimum requirements for hire are you must be at least age 17 and have a high school diploma or a GED. However, many positions would require more than the minimum, such as experience in customer service or a call center or a second language. In order to apply, go to the TeleTech@Home career page. Run a system check to see if your computer meets requirements. Fill out an online application and take a skills assessment. Within two days you should receive an email stating whether, based on your application and assessment, TeleTech would like you to interview for a position. If you are successful at the interview, another computer test is performed and an offer will be made. Drug testing and criminal background screening are required but TeleTech@Home pays for the cost of it. Although TeleTech@Home hires a virtual workforce it does hire its agents from everywhere. Depending on the client and the position, TeleTech@Home agents must live in the U.K. or certain U. S. states.